Published on 14 December 2012. 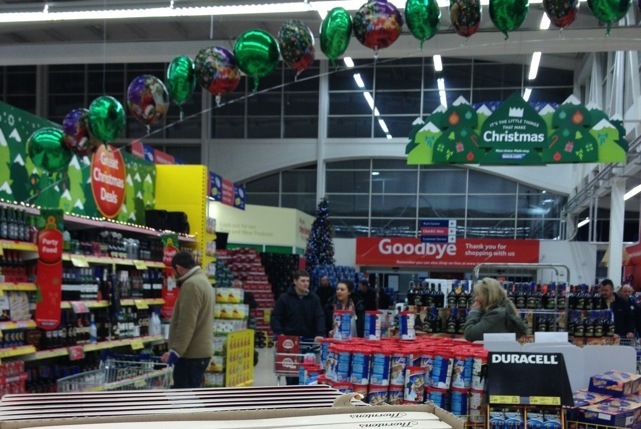 I’ve complained about Tesco piling up alcohol at the entrance before, as it really doesn’t strike me as responsible marketing. But today, the display was the biggest I’ve seen. I struggled to take a photo – as you can see – that captured the amount of alcohol there was on offer. It’s interesting that Asda agreed in 2011 to stop this kind of thing, and Morrisons has started putting fruit and veg offers at the front of their stores, yet Tesco still persists with an attitude of pile-them-remarkably-high and sell-them-remarkably-cheap when it comes to alcohol. This 1,929th post was filed under: Photo-a-day 2012, Retail.